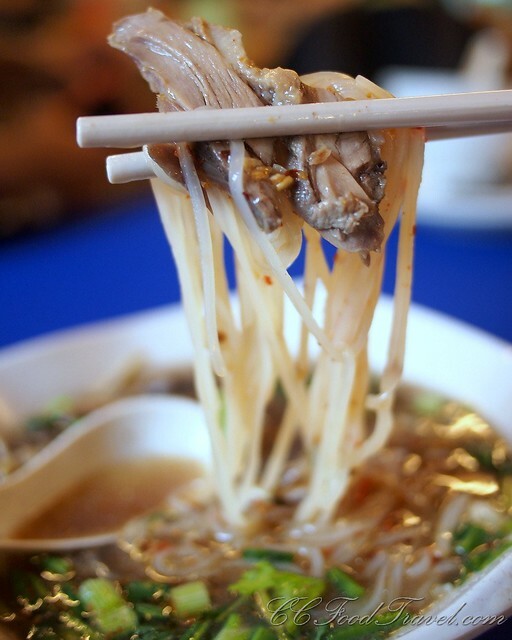 People ask us, where do you go for great Thai street food in KL? Well, we have five places that we frequent and love. Not just because the food is ultra spicy and tasty, but because of the humble set up and the authentic street food cooked by Thai residents in Malaysia. 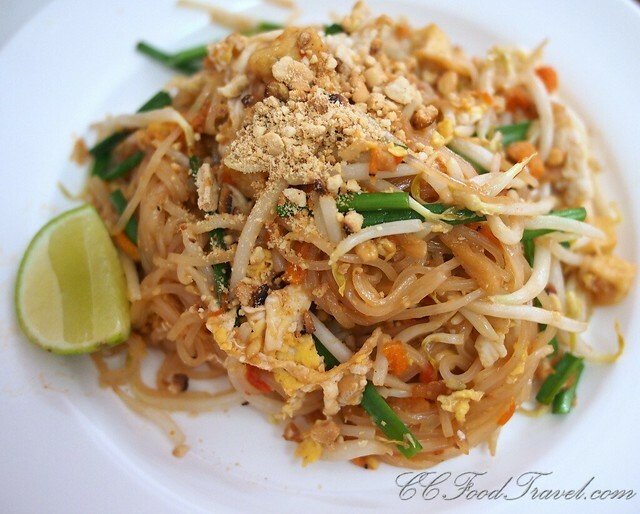 These are the closest dishes you will get to the thai street food, the sort you get in Thailand. 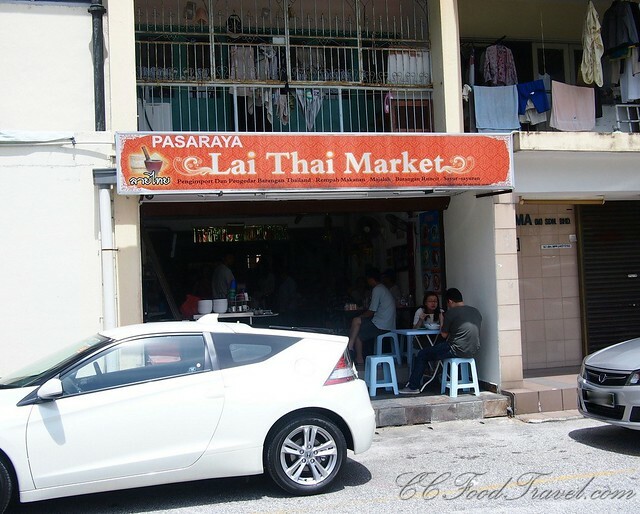 One of the best places for Thai street food in the bukit bintang area, is a small, unassuming restaurant on the top of the slope of Jalan Alor, called Thai Somtam Seafood. If you’re coming up the road from Changkat Bukit Bintang, it’s on your left, just after the lost cost hotel. If you turn right, you will enter Jalan Alor. The cook hails from Isaan Thailand, and the cooking is fantastic. 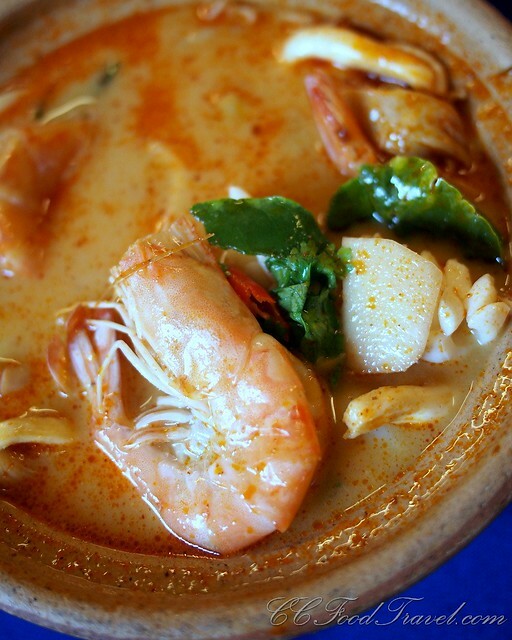 Thai food varies from region to region due to geography and history. 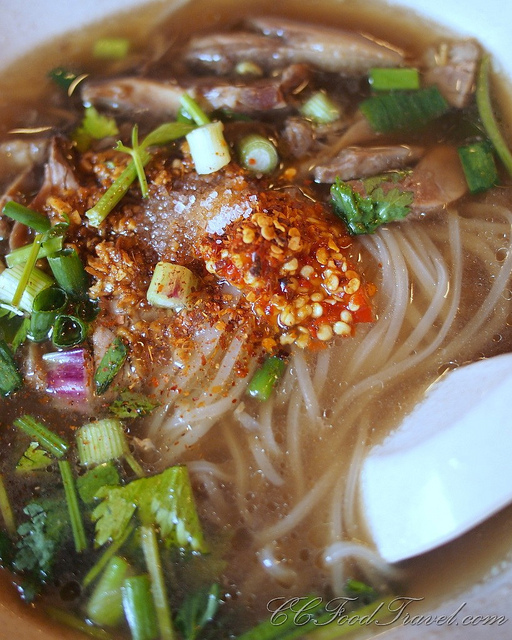 In the West, most Thai restaurants serve Bangkok-style cuisine. The food of Isaan is famous for being very spicy and pungent, seasoned with fresh herbs and fermented fish (plah rah), featuring some of Thailand’s spiciest salads. 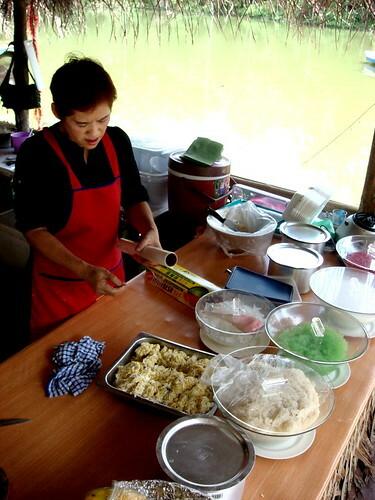 The cuisine has more in common with that of Laos then the rest of Thailand, as Isan people historically have been influenced by their neighboring county’s culture and speak a dialect that is closely related to Laos. 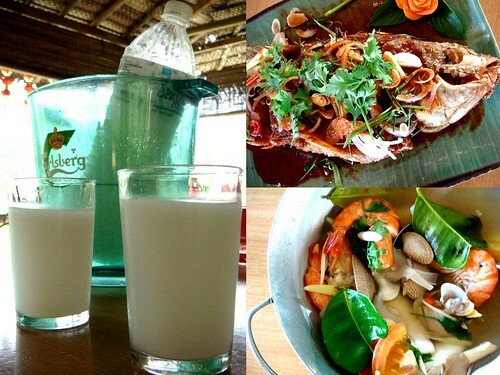 Perhaps the most unusual feature of Isan food is their taste for water buffalo, and jungle creatures like rice-field beetles, geckos, lizards, frogs and sour red-ant eggs. Well we asked but they didn’t have that here;) Go for the Duck Noodles and the Tomyam Gung instead then. Both can be cathartically spicy so be sure to go armed with tissues, wet wipes and of course wear no more than T-shirt, shorts and flip-flops. duck noodles – add your condiments.. I even add sugar to mine – you know they say, when in a Thai restaurant – do as the Thai’s! cathartic Tomyam Gung.. I found it just nice, but Cumi found it too spicy! 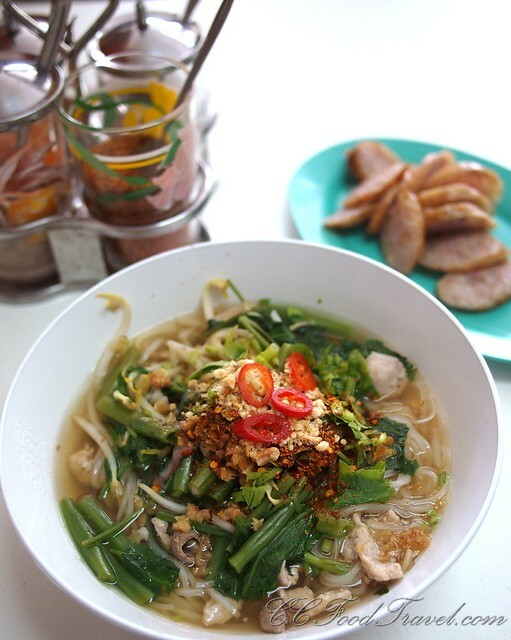 The next place on our list, is Lai Thai in section 17, now called, Frame Thai. This cramped little space functions more as a trader’s shop, for selling Thai imported food stuff. However, the owners decided to place a couple of long tables and chairs and voila, it became a coffee shop restaurant. The place gets really cramped and hot, so be sure to arrive early if you want a seat. Also, it’s not always open for business so that’s a bit of a put off, arriving and finding that they are not selling for the day, but hey, when it is open, the food truly is remarkably good. Go for the Mince Pork and Chilli (Lap Mu) and the Thai Papaya Salad (Somtam) here. It’s super spicy, packed and fragrant with herbs. 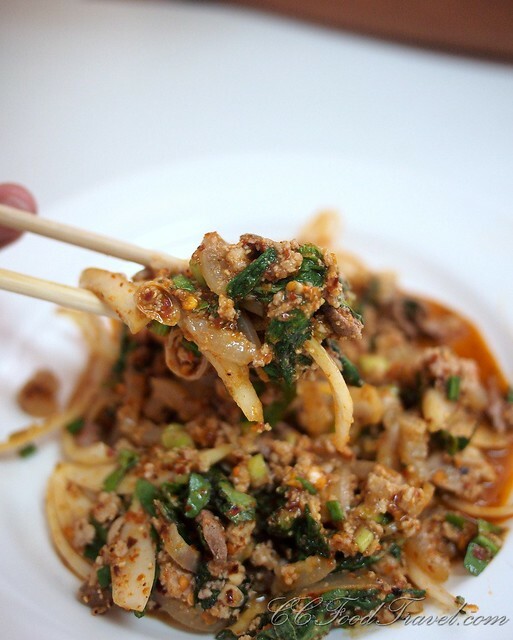 The Lap Mu is crazy tasty with bits of minced pork, pork offal, cartilaginous piggy ears, and so spicy you’ll be clutching your throat in pain and pleasure. The Somtam you should go for is the one with fermented crabs – this has a darker look to it, with a strong fish and shrimp paste flavour. 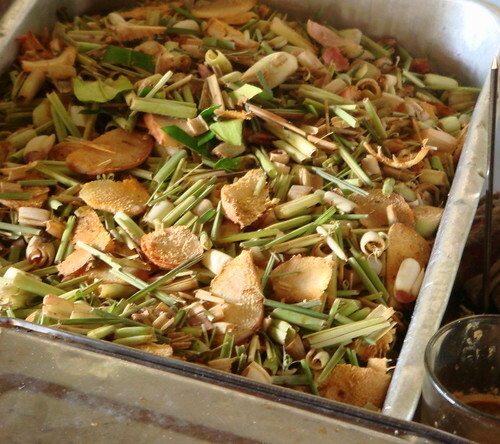 It stinks like belacan .. oo heaven! The Lap Mu at Lai Thai is crazy spicy and can be eaten with sticky rice or normal white rice. We chose to eat it with our noodles because sticky rice is just too heavy. 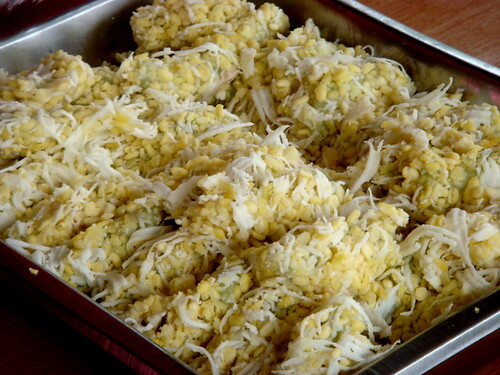 But the lap mu here is chunky, and I often see folks eating it with their hands -they take a chunk of sticky rice, and, using the sticky rice to cover the fingers, they grab a chunk of the minced pork, then stuff it in their mouths! Ah.. how heavenly. One day when I am carbo loading, I will try eating it like this! 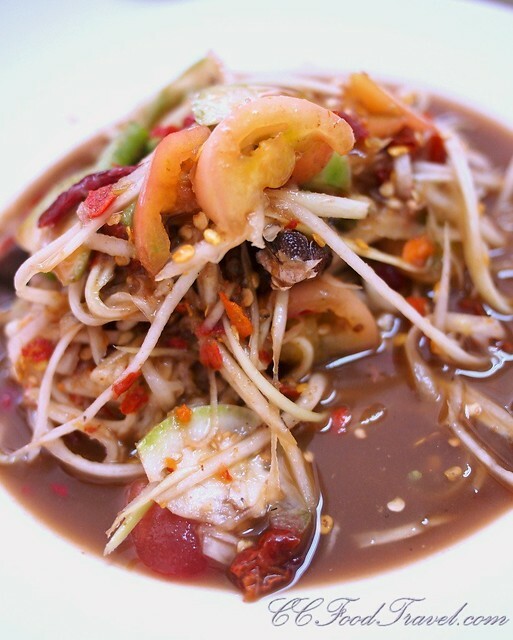 Green papaya spicy salad made from shredded unripe papaya. The dish combines the four main tastes of the local cuisine: sour lime, hot chili, salty, savory fish sauce, and sweetness added by palm sugar. The one to order at Lai Thai is the Somtam with fermented crab. Addictive, and pungent, you’ll find it hard to put down. 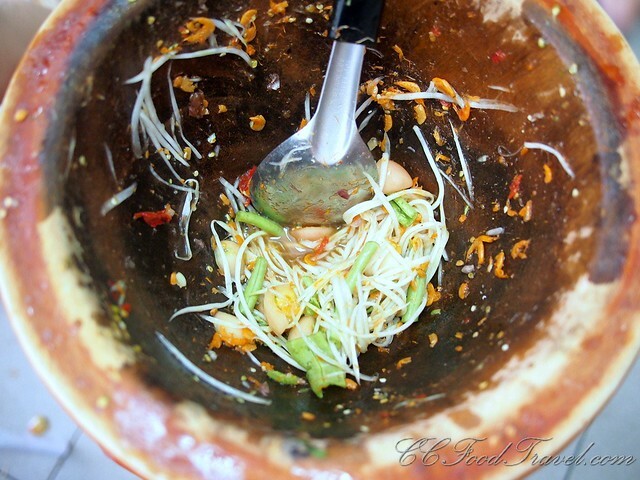 The ingredients are mixed and pounded in a mortar; the Thai name som tam literally translates as “sour pounded”. Despite the use of papaya, which one may think of as sweet, this salad is actually savory. When not yet ripe, papaya has a slightly tangy flavor. The texture is crisp and firm, sometimes to the point of crunchiness. It is this that allows the fruit to withstand being beaten in the mortar. In Thailand, it is customary that a customer ask the preparer to make the dish suited to his or her tastes and it’s the same at Lai Thai. You can tell them more spicy, less spicy – I heard one lady say 3.5 times more spicy.. so go figure! 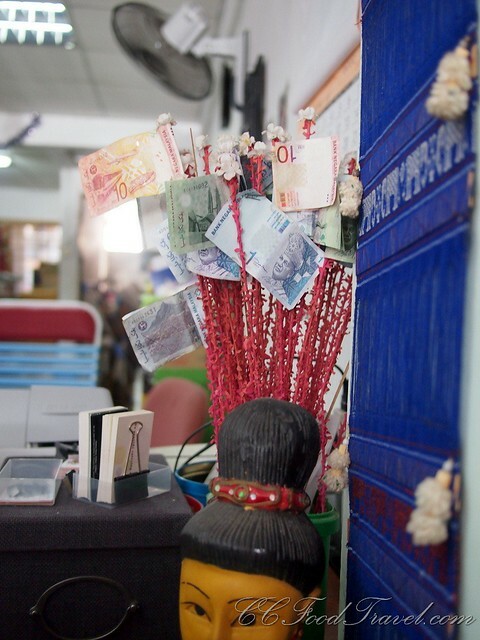 money plant for good luck.. may it rain with good business! Who would have thought that a quiet place like Happy Mansion would house such a terrific little thai restaurant? 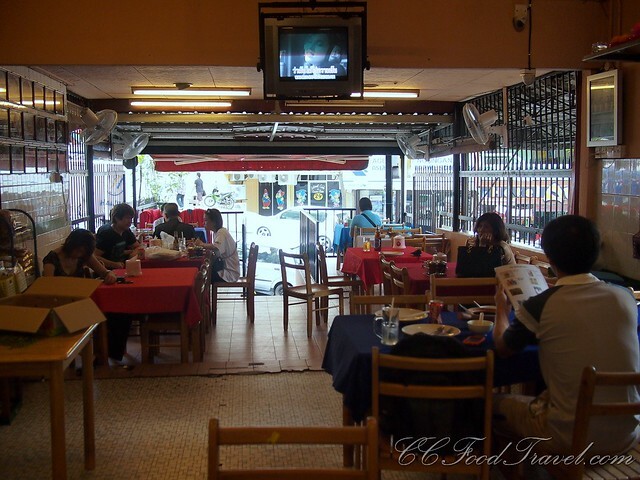 Baan Nok is a Thai restaurant located just above a thai gorcery shop called Thai Market Font, on Jalan Pandan Indah. 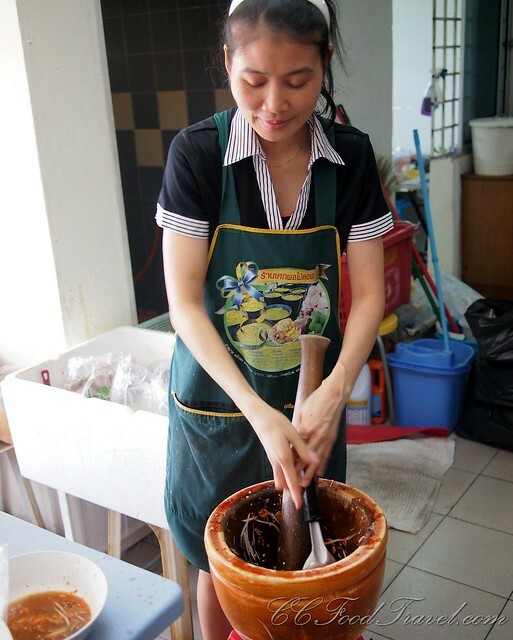 The wife of Thai Market Font’s owner comes from Chiang Rai – she is the cook and the food here is awesome. This place is actually related to Lai Thai, so no wonder the cooking is so good. Of course Baan Nok/Thai Market Font came first – this place is way older than Lai Thai. So what should you eat here? We love the somtam, the green curry, the tomyam gung.. and the thai desserts, though in all honesty, everything on the menu is good here. The somtam at Baan Nok is the lighter sort with loads of lime, sugar, groundnuts and makes it really good for the hot weather. There are grilled sausages, dried fish, all sorts of pickled vegetables, which you can select down stairs and even the somtam is made downstairs and sent up to the restaurant. Tomyam Gung – again mega spicy! We love the Tako here. The tako is rich, decadent and filled with crunchy water chestnuts! Kolam 77, fishing pond, Off Jalan Chan Sow Lin is another good place for cheap affordable Thai Street Food. The Chef here hails from Chiang Mai with decades of experience in the kitchens of banquet restaurants and hotels in Thailand. Apparently all the ingredients except produce and meat are direct from Thailand. We like the food here. Excellent stuff. This place is a little further off the beaten track, as it requires you to venture to KM4 in the Hulu Langat vicinity. Head towards Ampang, Hulu Langat and you will soon see the main-road, turn into a dust road. Follow that road till you hit a clearing and Lo and behold, the huts. At the entrance you will notice a couple of Thai folk busy preparing the seafood. 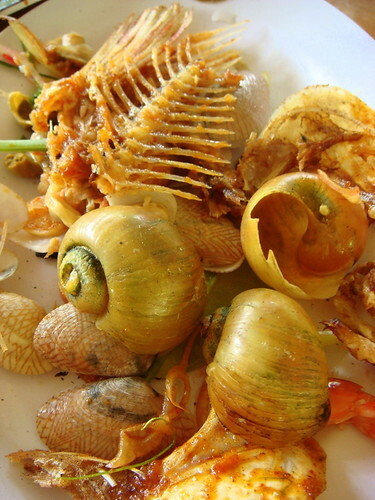 From the cleaning to the BBQ-ing of Japanese snails, fish and crabs, you will see and hear a lot of activity going on. For a mere two bucks, parents can distract their kids long enough to finish their own lunches before another grubby, fat hand reaches out for yet another bag of fish feed. Toddy and spicy seafood go together like lock and key. Nearly RM30 for a fish – tasty enough, but you can get that for twenty (or much less!) in KL. Also we opted for the ‘White’ tomyam, which was slightly bland and the only saving grace was the large number of prawns it came with. 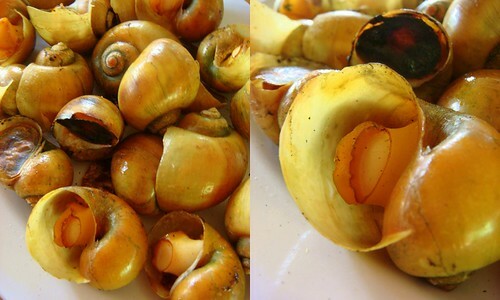 The Japanese snails. I ate all of these single handedly, dunked in a generous amount of spicy thai sauce. It really knocked my socks off. With buckets of pre-prepared marinade or smoking herbs? Somewhere, mid-meal, a man fishing in his boat, fell into the fishing pond. All the people eating lunch clapped and cheered and waved at him. It was really very funny. Immensely entertaining. Finally the tab tim grob for dessert. Cloyingly sweet, this is definitely more suited to Thai tastebuds. Mung beans – guaranteed to make you a farting machine. 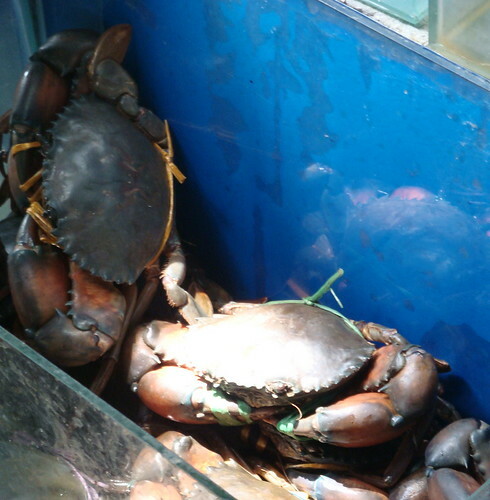 We steered clear of these, though they looked incredibly tempting. Finally time to pay the bill and go. Of course what this place has going for it is the scenic, novel fish farm and they obviously capitalize on that. Come here for great ambiance, but be prepared to pay a premium for your Thai degustation! 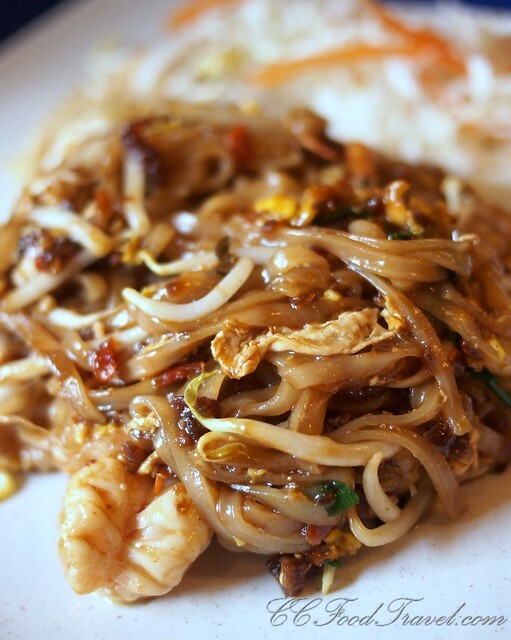 And these, folks, are the Thai street food joints that we truly enjoy in KL… what are yours?